This week in Pre Calculus 11 we finished off our sequences and series unit and began a new unit of Absolute value and Radicals. 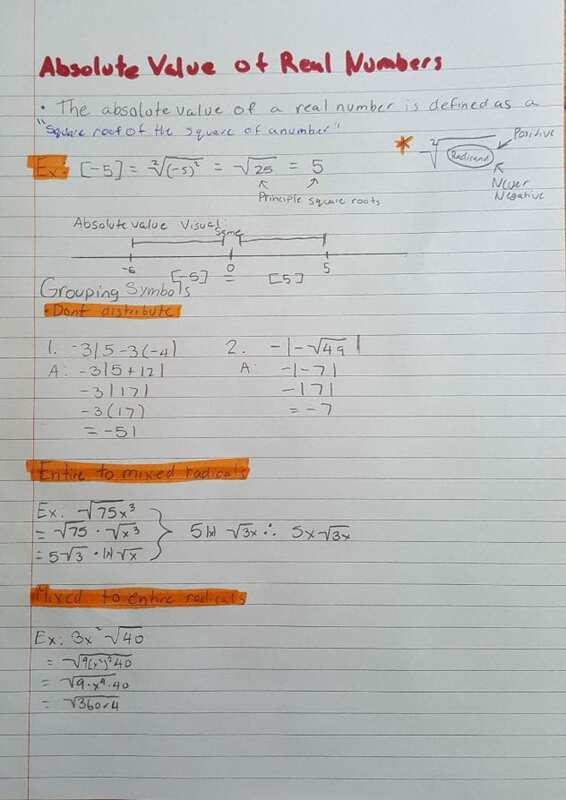 To begin the unit we where introduced to absolute values of a number (Ex: |-5| has an absolute value of 5). Later throughout the week, we expanded our knowledge to solve absolute value equations ( Ex: |-3|+|5-9(3)| ). We also learned how to change an entire radical into a mixed radical and vice-versa. The hardest thing that I found about this unit was keeping track of how many negatives you have in your equation, I have had problems with keeping track of my negatives and I would like to challenge myself to keep those negatives in mind. Overall I am feeling confident in my performance this semester and hope to keep it at the same pace. Below you will find examples of absolute values and expressions.